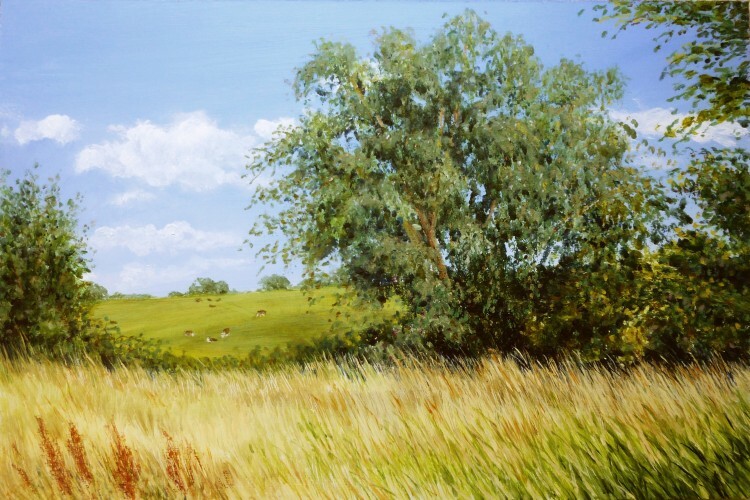 A bright sunny morning in the studio, and I finished ‘Willows on the Colne’ – so here it is! The timing couldn’t have been better, as, when I came in to check my emails at lunch time, I found that my painting boards to start the Essex Wood project were ready to collect! And 2 foot square looks very big!! But I’m looking forward to making a start on the large January painting in the next few days. It’s going to be of part of the footpath that runs along the southern edge of the wood, with glimpses of the fields through the trees. As it will be February on Monday I am very aware that I have some catching up to do – lots of work coming up! I also collected the last two frames for my dinghies for the Geedon Gallery – ‘Dinghy on the Falling Tide’, and ‘Poppy on the Blackwater II’ – so that’s a job for tomorrow . . .